The answer to that question, naturally, depends on who is asked. If one listens to OPEC and other oil-exporting nations, the main culprit is supply - whether with or without Iran's output - and the marginal price is set by whether supply is in excess or deficit. One thing that OPEC+ always assumes is that demand is stable, and most likely rising. On the other hand, if one listens to Wall Street firms, such as Goldman for example which have been urging their clients to keep buying crude all the way down into this historic plunge (as Goldman's prop trading desk has been selling), the reason for the sharp drop has little to do with supply and everything to do with market technicals and the underlying market structure. In a note released overnight, Goldman's chief commodity strategist Jeffrey Curie writes that "driving the most recent leg of the oil sell-off has instead first been momentum trading strategies and second, increased selling of crude oil futures by swap dealers as they manage the risk incurred from existing producer hedging programs in a falling price environment." Yet another theory is that a "whale" fund had been massively long - and wrong - oil while shorting nat gas, and the result has been a two week liquidation of the pair trade, as both legs have been unwound. While all these arguments have merit, the real reason for oil's precipitous plunge - according to Bloomberg Intelligence - is neither. Observing that Brent crude has lost $21 a barrel at yesterday’s close from its high this year on Oct. 3, Bloomberg's Ziad Daoud calculates that weaker demand accounts for $18, or 85%, of the price decline, while supply is responsible for the remaining 15%. In deriving his calculation, Daoud observes that the IEA (and even OPEC) recently lowered their forecasts for the growth in oil demand next year, citing a slowing global economy caused by rising trade tensions, higher interest rates and turmoil in emerging markets, as the reason behind the downgrade. That said, supply factors were not completely absent, but as shown in the chart above, these have only contributed 15% to the decline in oil prices since early October. Of these, the U.S. decision to grant waivers to eight countries to continue importing oil from Iran eased some of the supply concerns. Expectations of higher non-OPEC supply, particularly from the U.S., have also been a factor. How did Daoud conduct his analysis? 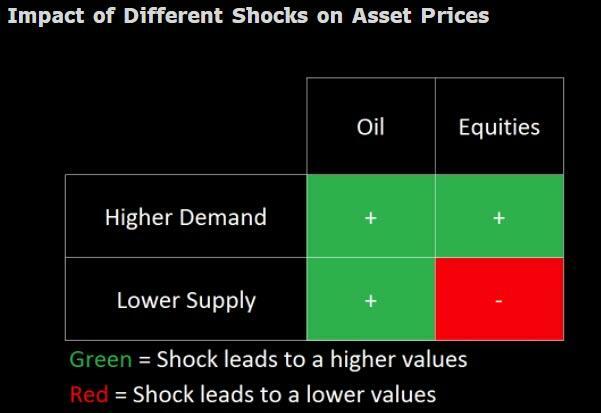 To identify demand and supply shocks to crude prices, the Bloomberg analysts made three assumptions: First, strong demand lifts both oil and equity prices. Second, supply disruption lifts oil, but pushes down on non-energy equity prices. Lastly, in any 30 minute period, oil prices are affected by demand or supply, but not both. In terms of procedure, the trading day was split into 30-minute intervals. In each interval, if oil prices and non-energy equities moved in the same direction, the change in oil prices was attributed to demand. If they move in opposite directions, it was due to supply factors. The close-to-open period was treated as one long interval and the same procedure as above was applied. What does this conclusion mean for oil prices and for global growth? Quite simply, the lower oil price is reflective not of algos going bananas, or even blowing up hedge funds, but reduced expectations for global energy demand. In other words, as Daoud writes, "we’re seeing the symptom of slower global GDP growth, not a new shock to the world economy", which incidentally is the worst possible option for OPEC, one it has absolutely no control over and what's worse, will force the cartel to cut production just to keep prices constant, a scenario that actively promotes cheating as OPEC members scramble to steal market share from each other. Meanwhile, there will be some second-round influences that make consumers in oil-importing countries better off. But the support that provides to global GDP will be smaller than it might have been had a glut of fresh supply gushed onto global markets. Naturally, lower prices will also make oil-producing countries worse off.